Up to 3 million children are at risk of being hungry in the school holidays. 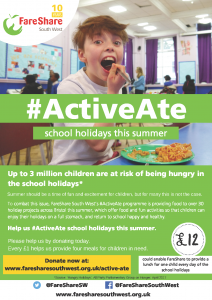 * In Bristol, the issue of Holiday Hunger is a huge concern, with an estimated 26% of children living in poverty**. When school stops, so do free school meals, which can be a huge strain on parents already struggling to make ends meet. 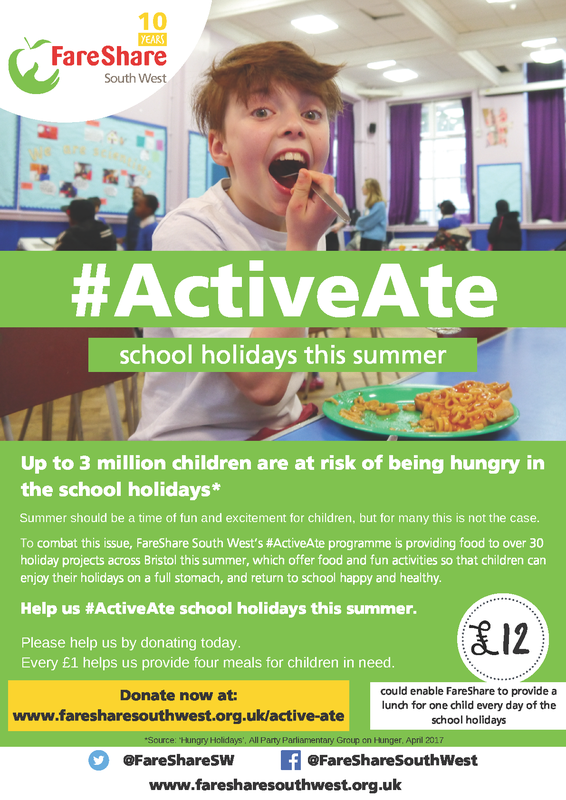 FareShare South West’s #ActiveAte programme, working with Feeding Bristol, is providing good quality surplus food to over 30 projects across the city, which offer food and fun activities so that children can enjoy their holidays on a full stomach, and return to school happy and healthy. FareShare SW is calling on the Bristol community to help us spread the word and raise the funds to cover the costs of this project. This is the biggest project of its kind in Bristol to tackle the holiday hunger issue, and we estimate more than tripling the current provision for food available for at risk children, based on Feeding Bristol’s recent report. If you or your company have the capacity to help in any way we would be delighted to talk to you, or invite you to visit our surplus food warehouse in St Judes to see what we do. Please get in touch with Phoebe Ruxton, the Fundraising Manager at phoebe@faresharesouthwest.org.uk or on 0117 954 2220.